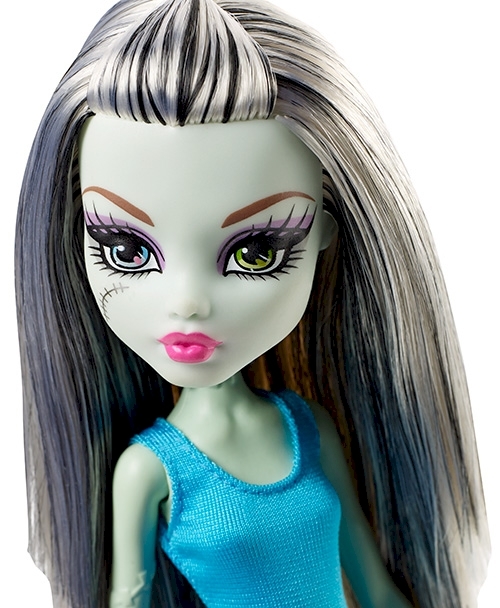 Create boo-tiful fashion designs for Frankie Stein™ doll with her Monster High™ Designer Boo-tique. Everything is included to express your personal style and creativity. Frankie Stein™ doll wears a dress that has a bright teal bodice and black and white print skirt, plus she comes with four additional dresses, all of which you can decorate. Simply pick a fashion and secure it on the dress form. Then choose a stencil and a color marker -- two stencil forms with multiple shapes and three markers are included: pink, blue and black. Place the stencil on over the fashion and design away! Or work freehand for a totally unique and ahhh-mazing look. Use one color or all three. Then pull the stencil away and admire your work. Add stickers from the included sticker sheet for even more decorative touches. There are zippers, Skullette™ heads and classic Frankie icons, like stitches, lightning bolts and safety pins. A freaky clawesome pair of black shoes and a silvery chain belt help to complete any look. A brush adds to the styling fun. 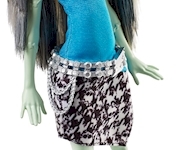 Design clothing for Frankie Stein™ doll to play out stories or display your creativity. 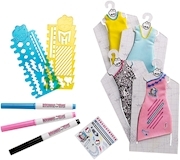 Young designers will love the opportunity to make voltageous fashions for the stylish daughter of Frankenstein -- and to express their own style, too! Includes Frankie Stein™ doll wearing fashion and accessories, four additional dresses, four dress forms, two stencils, one sticker sheet, three markers and a brush. Doll cannot stand alone. Colors and decorations may vary.